Turn off wireless and connect to network with ethernet cable (The wired connection is faster). If you are unsure how to do this, ask for help from the LRC staff (or one of your colleagues). If you've previously installed Imagescope, launch the program from Start->Programs->ScanScope->ImageScope. The upper left-hand corner of the window will show which version of Imagescope you have. The most recent version is v10.0.36.1808. If you do not have latest version of ImageScope v10 see Installing Aperio ImageScope directions below. Install/update Aperio ImageScope (Windows only). In the lower left corner you will be able to make an in-app purchase to buy the ability to access non-Aperio images on other websites. 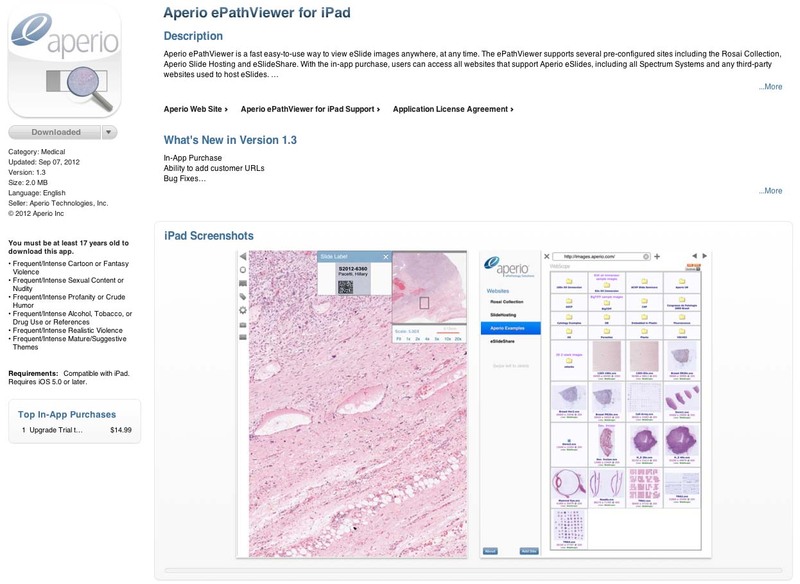 After you have upgraded your Aperio ePathViewer app, navigate to the Medical Schedule or Dental Schedule or Looking Glass Schedule and save the URL. You will now be able to use the Michigan Histology websites and to open virtual slides in the Michigan virtual slide collection. You will be able to zoom in and out and to move within the slide. Thumbnails of the most recently opened virtual slides will be kept and enable you to revisite slides you have viewed before. However, example images on the webpages will not open appropriately. Download latest version of ImageScope. After downloading, double-click on the file (ImageScopeInstaller.exe) to launch the installation program. 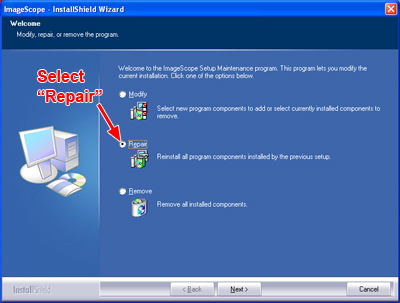 If you have a previous version of ImageScope installed, the installer will ask if you want to Modify, Repair, or Remove the previous version. Select "Repair," then click "Next." If you have problems, try shut down/restart. Go to the "Tools" menu, then "Options". In the Options window, click on the "Performance" tab and UNCHECK the "Prefetching" option (see example) if it is checked, but leave the "Progressive Rendering" option checked. On this webpage, click on the “Histology” folder (see screen shot) to access the slides that will be used in the medical histology course. A good slide with which to start is number 29, which is a very well prepared cross section from the small intestine. 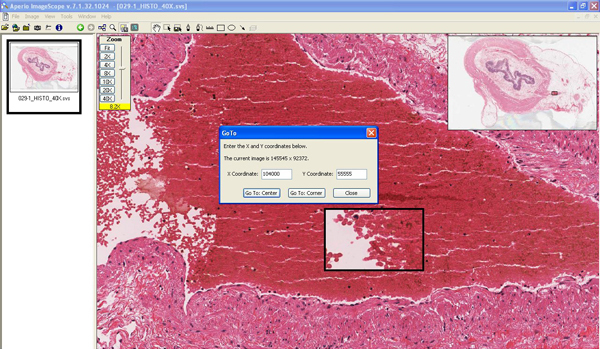 To get to this slide, you’ll have to go through several subfolders, so click on the “Histology” folder, then “Basic Tissues,” and finally “Epithelium and CT.” (hyperlinks to the folders have been provided, but it is useful to get a feel for the file structure since you’ll be accessing these files a lot in the coming year). 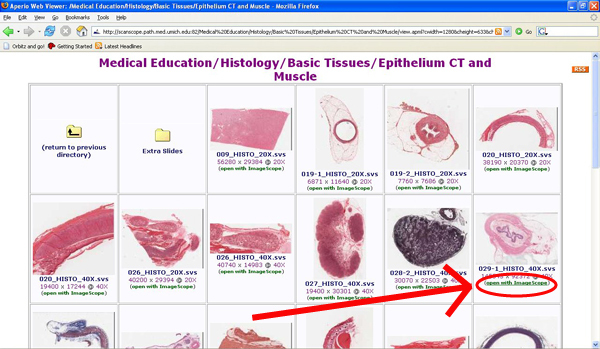 Once in the Epithelium CT and Muscle” folder, you’ll see all of the virtual slides referenced in the Epithelium, Connective Tissue, and Muscle Tissue sections of the laboratory manual (see screenshot). Clicking on any of the image thumbnails or the blue hyperlinks will open the image in WebViewer. To view slide 29 in ImageScope, click on the “open with ImageScope” link just under the file named “029-1_HISTO_40X.svs”. 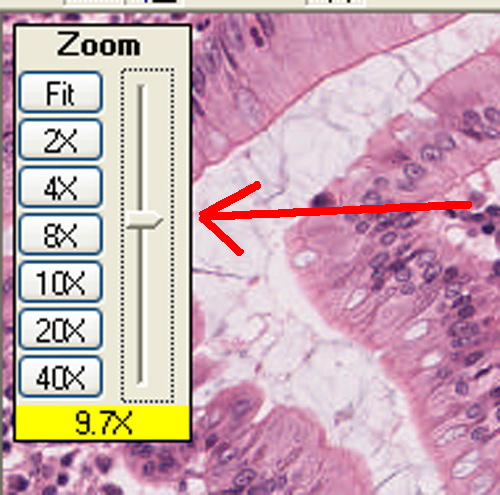 If you are using ImageScope for the first time, the default view will be something like what is shown below. The viewing options are explained below and may be changed by checking/unchecking these options in the “View” menu. Image thumbnail: • This provides you with an orientation as to which region of the slide you are viewing. Zoom in a particular region of interest, and you’ll see a red box on the image thumbnail outlining the region you are viewing. Image: • As you mouse over the image, you’ll see that the pointer is a hand that allows you to grab the image and move it in any direction. Clicking on the scroll wheel activates the “pan” mode that allows you to move across the image by simply moving the mouse (the panning speed corresponds to the distance the mouse is moved). Status bar: • The status bar provides information regarding the overall size of the image (in this case 145,545 x 92,372 pixels), the raw file size (37.6 GB), and the compressed file size (1.5 GB). The second column in the status bar indicates the coordinates of pixel located in the upper left corner of the image and the total size of the region being viewed. The third column indicates the actual coordinates of each pixel indicated by the pointer as the mouse is moved over the image. These coordinates are very useful for going back to a particular region of a slide, as illustrated below. Zoom in on the blood vessel indicated by the magnifier (#5) and place the pointer somewhere in the middle of the vessel. Write down the coordinates (the first is ‘X’ and the second is ‘Y’). Now, zoom out and move the image so that the blood vessel is no longer in view. Click here to view a web tutorial created by Dr. Stoolman showing how to use the annotations feature. 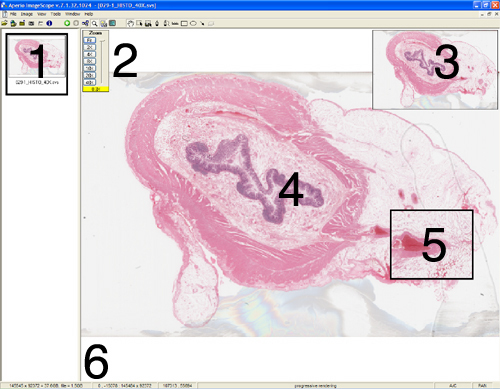 This exercise will use one of the images from the virtual microscope slide collection to show you how to take advantage of many of the features of the Aperio ImageScope program, namely using the annotations feature to label regions of interest in digital images. Using the “GoTo” command to go to a region of interest. In the “Image” menu, click on the “GoTo” command. Enter the coordinates you recorded from above and then click on the “Go To: Center” button. This should bring the blood vessel back into the field of view, and, if you zoom in, you will find that the coordinates you entered above are in the center of the field. As you study these slides, you should note the coordinates of particularly good examples of cells or tissues so that you can go back to them easily for review. Using annotations in ImageScope. One of the most useful features of the ImageScope program is the ability to annotate images. It is important to note that the original image is not altered in any way. Instead, the annotations are kept in a small file that stores information regarding the pixel coordinates and magnification of an annotated region and simply “overlays” the annotations on the image. Use the ruler tool to determine the diameter of a blood vessel. Use the arrow to indicate a goblet cell. 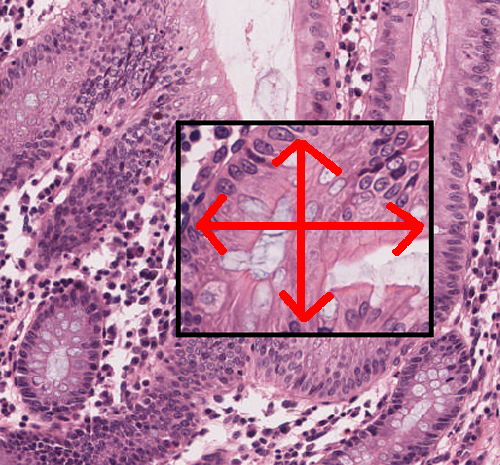 Use the rectangle to outline several columnar epithelial cells of the intestinal muscosa. Use the ellipse to indicate a bundle of collagen fibers in the submucosa. In a new layer (call it “muscle1”), use an arrow to indicate the inner circular muscle layer. In another new layer (call it “muscle2”), use an arrow to indicate the outer longitudinal muscle layer. To save your annotation file at any point, click on the “Export Annotations to File” button. To keep track of these files, it will be helpful for you to include your uniqname in the file name (e.g. “jvelkeySlide29”). If you need help remembering what some of the structures above look like, save what you’ve generated so far and click on the “Delete all Layers” button. Then, import the “jvelkeyEpithSlide29” annotations file to review the structures. When you’re ready to get back to your own annotations, just “Delete all Layers” again and import your own annotation file. Unfortunately, there is currently not a way to annotate slides viewed with the WebScope. However, you can at least create "Bookmarks" to regions of interest on a slide that you can use to quickly open a slide and take you back to a particular region. Open Slide #126 using this WebScope. Find a region of interest. To bookmark that region, click on the "checkmark" icon in the toolbar (see example). A new window (see example) will appear giving you a link that can be used as a "bookmark" for WebViewer and a similar link to open that same view in ImageScope. Clicking on the WebViewer link will take you to that specific view and you can then use the "Add Bookmark" tool on your browser to add it to your bookmarks. Go to the "Insert" menu, choose the "Hyperlink" option, then PASTE the URL into the address field (see example).